Many years ago, a friend made cranberry banana bread for a holiday party I attended. Ever since then, I think about making it but had never found a recipe that I liked. Last weekend, I took the time to create my own recipe for a delicious Weight Watchers Recipe for Cranberry Banana Bread. This version has only a hint of sugar, ton of flavor, is thick, rich, moist, and everything I wanted in a sweet bread. I wanted to use fresh cranberries for this cranberry banana bread, but they weren’t available locally in summer. So, instead, I used canned whole cranberry sauce. While I try to avoid canned foods as much as possible, it wasn’t as bad as I expected it to be when it came time to calculate the points for this recipe. We often get bananas really cheap when on sale because they are beginning to become overly ripe. When that happens, I like to use a few right away for recipes or smoothies, then toss the rest into the freezer for future recipes. I find that thawed frozen ripe bananas add a bit more moisture to recipes, and are a cheap way to cut back on oils and sugars in many dessert or sweet bread recipes. This is a super moist and dense bread. It is definitely not a light and airy bread like a muffin would be. When I want something to be satisfying in both texture and flavor, this is the type of bread I reach for. A small slice of this, because of the oats and added moisture, is super satisfying to me. Traditional muffins or sweet bread recipes tend to leave me hungry or craving more. I start by mixing together the bananas, whole cranberry sauce, eggs, and coconut oil. The whole cranberries in the sauce keep it from being completely smooth, but I like having as much of this well blended as possible before adding in my dry ingredients. Add in the rest of the ingredients and mix until just thoroughly moistened. I used a single loaf pan that I lightly sprayed with non-stick spray. You could use a silicone muffin tin and make these individual portion sizes if you prefer. If you do choose to make in muffin or cupcake liners, you’ll want to cut the cook time back from 35-40 minutes to only 15-17 minutes. Spray loaf pan with non-stick cooking spray. Blend together bananas, cranberry sauce, eggs, honey, and coconut oil until smooth. Some whole cranberries will remain, but you want this mixture to be mostly smooth. Gently mix in dry ingredients until just moistened. Don't overmix, but do make sure all flour and oats are well incorporated. Pour into prepared loaf pan or cupcake liners. For loaf pan - bake at 350 degrees for 35-40 minutes or until a toothpick inserted in center comes out clean. For muffins - bake at 350 degrees for 15-17 minutes or until a toothpick inserted in center comes out clean. 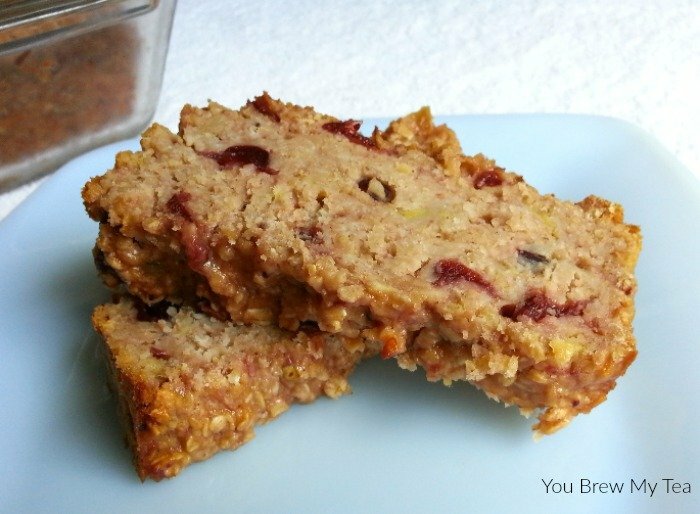 This cranberry banana bread recipe is a great choice for a dessert treat or a healthy breakfast bread alongside some lean protein! I calculated the point values using the Weight Watchers Recipe Builder in my own personal plan with Weight Watchers. Another option for calculating points if you aren’t a Weight Watchers member is to use the Weight Watchers SmartPoints Calculator. If you are using the PointsPlus plan, you can use the Calculator Cat tool to determine your Points Plus for this recipe. I cut this into 12 portions but did want to clarify that the slices shown in the picture are 2 portions each. Regardless, they are still a great lower point value snack or dessert that can easily fit into your diet. With high fiber and tons of flavor, they are definitely a favorite. 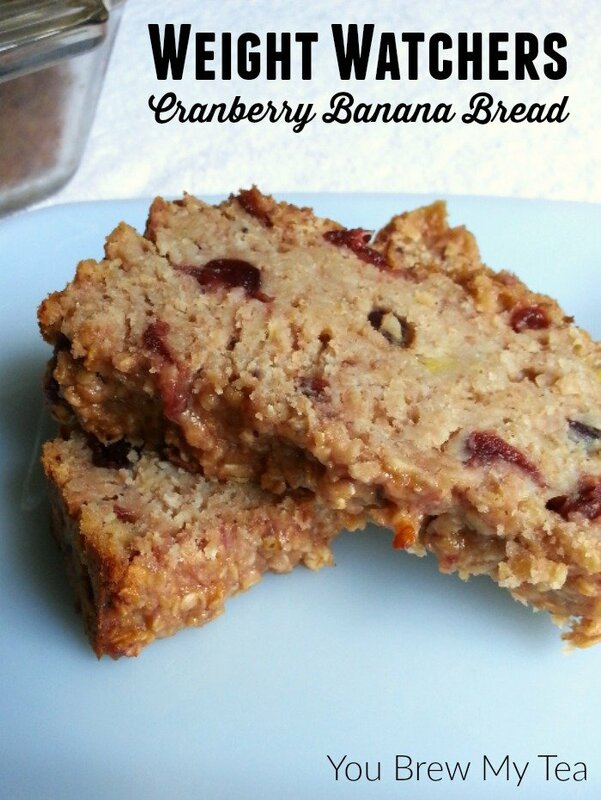 I have been using this yummy Weight Watchers recipe for Cranberry Banana Bread as a breakfast choice alongside some fresh fruit and lean meat like grilled chicken or grilled turkey. It adds that fiber I want from the oats, the sweetness I often crave, and is super filling for the early mornings when I am not really hungry but know my body needs extra fuel for the day. This looks like something worth indulging in. It looks like a wonderful bit of comfort food. wondered about cranberry sauce having a fair amount of sugar…would the recipework if I just used fresh cranberries & coconut sugar or sweetner ? Love the idea of making as muffins…. I am sure it could be adapted. The issue would be moisture more than actual sugar in that. You could cook down your own fresh cranberries with Splenda or honey and use the same amount instead of the canned variety.